Inspired by nature and the wild woman archetype featured in Clarissa Pinkola Estes’ Women Who Run with the Wolves, SpaRitual celebrates a new perspective on beauty with the release of Wilde, the brand’s newest Fall 2011 nail lacquer collection. The Wilde woman embodies her authentic self while moving with the natural rhythms of life. These jeweled lacquer colors represent her warmth and strength and have a mystical depth of color in each layer. 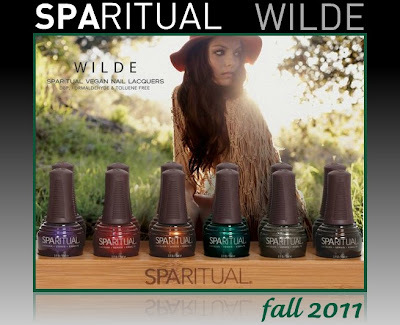 Wilde shades include Spirit Child, a fiery red shimmer, Running with Wolves, a rich copper patina, Rhythm of Life, a glistening emerald, Instinct, a majestic, shimmering purple, Howl, a deep, golden black, and Sacred Ground, a sparkling grey. Release date: September 2011. I am loving these. Hope they live up to that! I love Sparitual's colors and formula. These colors look so fascinating! I have the book, haven't read it all but alot of stuff in there I relate to. I've never heard of Spa Ritual before... Is it just as good (or better) as the other well known brands? never heard of this brand, but i love those colors! I cannot wait until Sept for these! They really look pretty. Where is a good place to buy Spa Ritual? Cannot wait to see real swatches of these beauties! I'm really looking forward to seeing more of Sacred Ground!